If you grab hold of a DNA molecule and wind it up, supercoils occur that look like the annoying loops in the cord of your earphones. Research at Delft University of Technology has shown that these loops can move far and rapidly along the length of the DNA molecule. This recently discovered hopping mechanism, which occurs at a timescale of milliseconds, might have important biological consequences. Cells might use the loops, for example, to bring specific pieces of DNA in contact with each other. Researchers from this programme, working in the group of FOM workgroup leader professor Cees Dekker at the Kavli Institute of Nanoscience, published their discovery of the hopping mechanism in Science. A DNA molecule in a cell looks like a thread that is completely coiled up in a confusing mess of loops (supercoils). In living cells DNA supercoils form and disentangle themselves and move along the DNA molecule. They are vitally important for the regulation of DNA activity, for example which genes are switched on and off. Although stationary images of the DNA supercoils have previously been studied in great detail, the movement of the coils had not been detected. The researchers developed a new technique with which they could first of all observe how the loops moved along a DNA molecule. They stretched a small piece of DNA strand using magnetic tweezers and imaged the movement of the DNA loops using fluorescence microscopy. They managed to see these movements in real time at the level of an individual DNA molecule. Researchers have discovered that the loops can slowly move along the DNA by means of diffusion. In addition, and completely unexpected, they observed that the loops can make jumps across relatively long distances (micrometres). A loop disappears at one spot and another loop suddenly appears much further away. The researchers can use this information to test theories about DNA mechanics. This newly discovered hopping mechanism might have important biological consequences. For example, it would make a restructuring of the genome over long distances and at a timescale of milliseconds possible. You can see the hopping mechanism in this film (Dutch or English). Artist's impression of the dynamics of DNA supercoils. 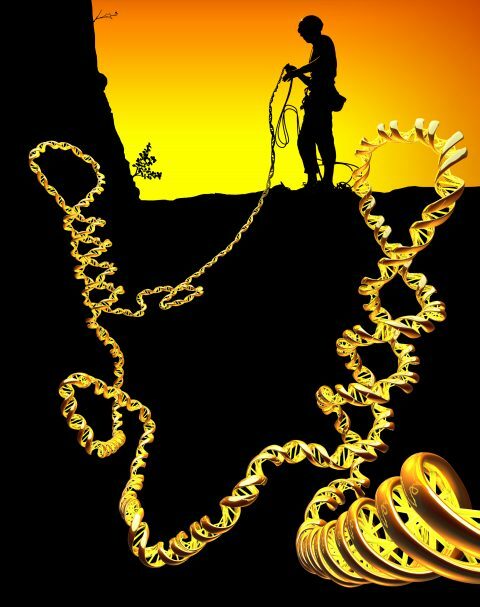 A person manipulates a long DNA strand. When this is wound up, coils in the DNA molecule occur. In the research of Van Loenhout, Grunt and Dekker it was discovered for the first time how these DNA coils move along the DNA molecule.